Can anything stop GN'R's downward spiral? For Axl Rose, it's bad times. A week ago, his much-anticipated album Chinese Democracy debuted to less-than-stellar chart showings - in the UK it was handily beat by The Killers' Day & Age, and in the US it did even worse, coming in at Number 3 behind Kanye West and Taylor Swift. And now it appears that the raging apathy of once-fervent Guns N' Roses fans continues. 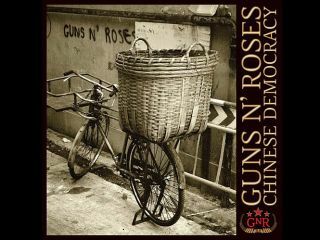 Final sales figures are still coming in, but in the UK, Chinese Democracy dropped off the Top 10 and slid to Number 11. And in the US the story is even grimmer, where the record nosedived to Number 18 - a 78 percent drop-off from its first-week sales. With radio stations turning a deaf ear to the album, it would seem that the goose that is Chinese Democracy is cooked. But some insiders close to the Guns N' Roses camp still view the record as a long-term winner. Bob Chiappardi, the New York City-based CEO of Concrete Marketing, has worked with Guns N' Roses since the Live Like A Suicide EP. Recently, his company worked on TV ads for Chinese Democracy and serviced the album to gentlemen's clubs in the US. According to Chiappardi, the record has yet to receive its moment in the sun. "We all expected a situation with the numbers falling off," says Chiappardi. "First off, it's not in every record store in the country, which doesn't help. But I hope it's going to follow the same kind of life of the Kid Rock record, where songs keep coming - then we'll have really good numbers by summer." Radio's resistance to the title cut is "disappointing," says Chiappardi, but he believes that several of the album's ballads "are going to come through. Maybe not on a November Rain basis, but there's some tracks there." Above all, Chiappardi claims that Chinese Democracy needs time and nurturing. "The record is like a unicorn - there's a legend around it," he says. "It's hard to explain. I think once the smoke clears, it'll rise to the top."